Srijit Goswami is a tenure track team leader in the topological quantum computing roadmap in QuTech. During his graduate studies Srijit studied electrical and thermoelectric transport in low-dimensional systems in semiconductor two-dimensional electron gases. Funded by the Gates-Cambridge Scholarship, he completed his PhD from the University of Cambridge in 2011. As a postdoctoral researcher at the Indian Institute of Science and TU Delft he studied mesoscopic transport and superconductivity in two-dimensional systems such as semiconductor quantum wells, oxide interfaces and graphene. Srijit’s group aims to use semiconductor-superconductor hybrids to develop scalable two-dimensional platforms for Majorana-based topological quantum computing. A promising approach toward building a topological quantum computer is to combine one-dimensional nanowires with large spin-orbit coupling and conventional superconductors. In the presence of a magnetic field the ends of these wires are expected to host Majorana zero modes (MZMs). Since the first signatures of MZMs were observed in nanowires in 2012, there has been remarkable progress in the field, whereby the very existence of MZMs has been put on much stronger footing. The next important step toward realizing a topological quantum computer is to scale these systems up. The past few years have seen remarkable progress on the theoretical front leading up to concrete, experimentally viable proposals for creating topological qubits. Each of these approaches employs different schemes to encode the qubit and to perform topologically protected braiding operations. However, they all share a common requirement: the ability to engineer a large number of well-ordered topological regions integrated with auxiliary elements to manipulate and read out the state of the qubit. 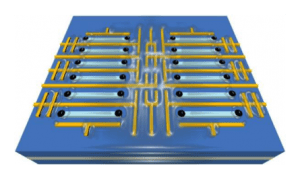 Our group aims to use wafer scale III-V semiconductor two-dimensional electron gases (2DEGs) to bring together all the necessary ingredients for topological quantum computing onto a single, scalable 2D platform. The inherent flexibility offered by a 2D architecture will allow us to study different protocols for the generation and detection of MZMs.